NETWORK FINALS: CBS’s NFL PRESEASON game adjusted to 0.8. In addition, the rerun of AMERICA’S GOT TALENT lost 0.1 in final numbers. CABLE HIGHLIGHTS: A&E’s LIVE PD led Saturday cable at 0.67, down 0.05 from last week, with the clip show lead-in down 0.04 to 0.30. NFL Network’s NFL PRESEASON games were at 0.37/0.28. The Adult Swim line-up performed as follows: MY HERO ACADEMIA up 0.05 to 0.29/615K, DRAGON BALL up 0.02 to 0.34, ATTACH ON TITAN at 0.23/477K & 0.25/528K compared to last week’s 0.21, POP TEAM EPIC up 0.02 to 0.16, JOJO’S BIZARRE ADVENTURES up 0.01 to 0.17/386K, HUNTER X HUNTER down 0.01 to 0.15/278K, BLACK CLOVER up 0.01 to 0.17/382K, NARUTO up 0.02 to 0.16/358K, ONE PUNCH MAN up 0.01 to 0.15/340K, LUPIN THE 3RD up 0.01 to 0.12/260K, and COWBOY BEBOP up 0.02 to 0.12/269K. 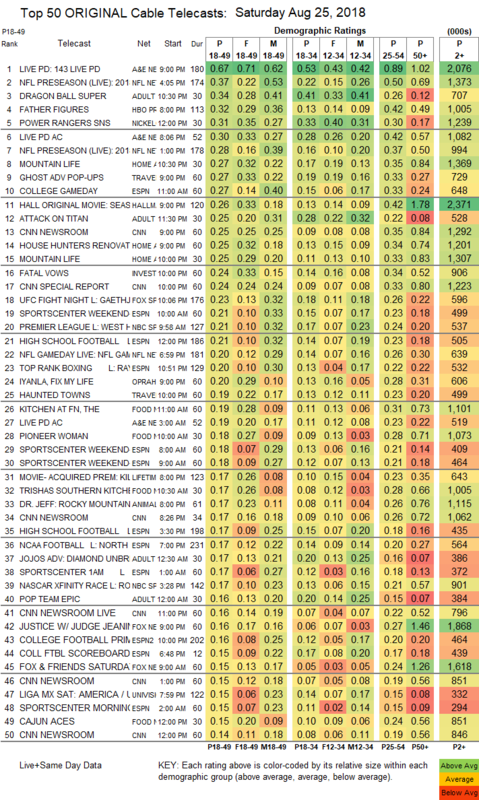 Nickelodon’s noon POWER RANGERS hit #5 for the day at 0.31. HGTV’s line-up was led by MOUNTAIN LIFE at 0.27/0.25. 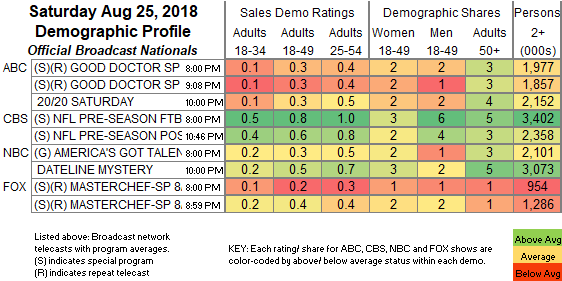 Travel Channel’s GHOST ADVENTURE POP-UPS was steady at 0.27. Hallmark’s movie SEASON FOR LOVE was at 0.26. ID’s FATAL VOWS ticked up to 0.24. Fox Sports 1’s UFC FIGHT NIGHT was at 0.23. NBC Sports Network’s PREMIER LEAGUE morning match was at 0.21. On OWN, IYANLA FIX MY LIFE rose 0.06 to 0.20, and MIND YOUR BUSINESS was at 0.13. On Food Network, KITCHEN AT FN held at 0.19, PIONEER WOMAN dropped 0.05 to 0.18, and TRISHA’S SOUTHERN KITCHEN was down 0.03 to 0.17. TLC’s FOUR WEDDINGS ticked down to 0.13. HBO’s DREW MICHAEL special was at 0.05.